A controversial former Karabakh reporter has launched a new newspaper in Armenia, claiming that it will become a tribune for all political forces which possess sensible ideas and sane policy and will serve the interests of society. “Yerrord Uzh” newspaper appeared this week in Yerevan thus joining the ten major newspapers which claimed to be independent print media in Armenia. Vahram Aghajanyan, the editor of “Yerrord Uzh” (Third Power) says despite the variety of newspapers in small Armenia society has no sympathy with the press, but apathy as the mass media is out of touch with the community. The full-color 16 page newspaper has circulation of 3,000 and a staff of 25. Aghajanyan would not disclose the paper’s sponsors, saying only that he is supported by a group of businessmen from Russia, US and Europe who do not represent any specific political forces. 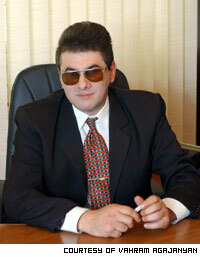 Aghajanyan himself experienced persecutions and is known for his sharp criticism of Karabakh current authorities. The reporter moved to Armenia from Karabakh in 2000, after he spent 10 days in Karabakh prison for stories commenting on the politics of the prime minister and assassination attempt against Karabakh President Arkady Ghukasyan. The president was wounded when two gunmen riddled his Mercedes in March 2000. The stories were published in Karabakh “Tasnerord Nahang” (Tenth province) which was controlled at that time by Defense Minister Samvel Babayan, who was accused of organizing the assassination attempt and was imprisoned for 14 years. 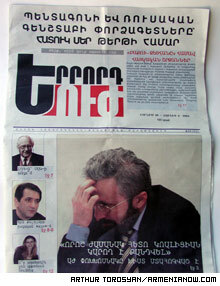 The newspaper has suspended publications, and Aghajanyan (who called the situation in Karabakh following an assassination attempt a “witch hunt”) was accused of slandering Prime Minister Anushavan Danielyan and defamation of the facts in his story related to the government policy towards Karabakh resettlement. Vahram Aghajanyan promises a platform for sensible policy debate. Aghajanyan was sentenced to 12 month in prison but was released. Aghajanyan until recent times was also reporting for Yerevan “Iravunk” (“Right”) newspaper, the official organ of the Union for Constitutional rights which supports Babayan. Despite many Armenian journalists claim that the mass media in Armenia is not independent and freedom of speech is being suppressed it does not prevent the production of more newspapers. Armenian mass media community is represented by 46 newspapers (nine are most influential) 61 TV companies and 13 radio stations.